This eight-day bear tracking trip in Slovakia looks great fun. You’l work with the expert guides and rangers who lead the High Tatras bear project, you will search not only for bears, but also wolves, wildcats and more. Accommodation is in remote mountain cottages, usually reserved only for park rangers. These cottages offer immediate access to prime wildlife areas. You will be fully integrated in this study, with access to all the latest data collected and you will also be able to track the movements of the study bears wearing GPS transmitters. You’ll also have access to the Bielskie Tatry (White Tatras), an area usually off-limits to the public and strictly controlled as a National Park. Included in the price is a sizeable contribution which goes directly to bear conservation in Slovakia. All in a all a worthwhile and fun way of spending a long week. The vast taiga forest of Finland are still home to sizeable numbers of brown bears. Heading deep into the forest to specially prepared observation hides, the organisers aim to spot this amazing animal in its natural habitat during this exciting long weekend. You’l travel east towards the Russian border. The proximity of this area to the Arctic Circle, with resultant long hours of daylight increases the chances of viewing these predominantly nocturnal animals. Our isolated hides, located in a small open wetland area, have been adapted to maximize the chances of spotting bears, whilst balancing the needs for a level of comfort. As well as bears, sightings of elk, fox and wolverines are also possible. Trips are accompanied by a local naturalist guide. There are a number of possibilities for watching brown bears in Finland. Brown bear watching in Finland. 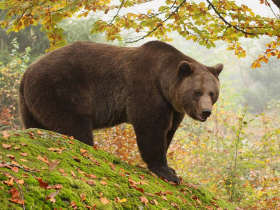 Observe European Brown Bears. Sparsely populated Eastern Finland is an untamed expanse of pristine natural beauty. The vast, dense taiga forest, interspersed with lakes and rivers, offers a haven to the elusive European brown bear. Heading deep into the forest to specially prepared observation hides, we aim to spot this amazing animal in its natural habitat during this exciting long weekend. Rather nice images video here fo these trips.